In these times of economic retrenchment and serious belt tightening, many consumers, both home users and small to medium businesses, are opting to hang onto older technology assets rather than replacing them. The people at iolo Technologies have made this decision a little less painful by virtue of the latest iteration in the System Mechanic family of utility suites, System Mechanic 10. This software offers a suite of utilities designed to extend the useful life of PCs by restoring full functionality to moribund PCs and preventing new PCs from becoming bogged down in the first place. They accomplish this by a combination of advanced technology and enlightened business practices. 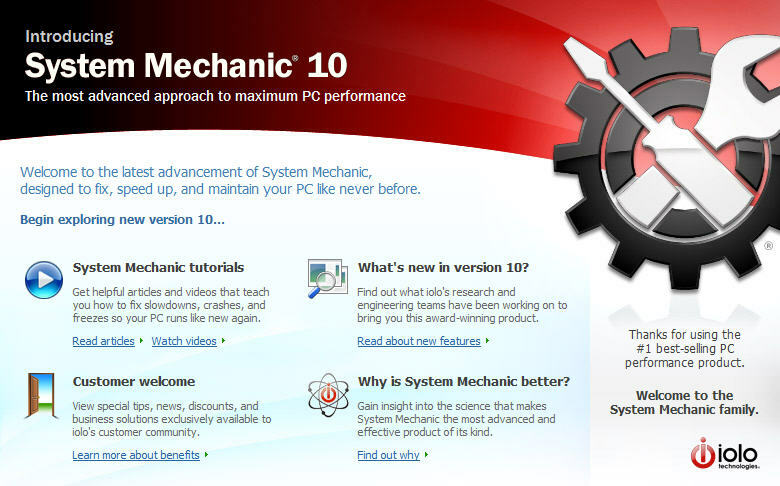 System Mechanic 10 has been engineered from first principles to be a reliable tool for both newbies and experts. For ease of use it provides naive and novice users with a structured, intuitive interface that permits them full access to all of the application’s features with a minimal learning curve. It offers 3 primary ways to access the programs features, the “Dashboard”, “Toolbox” and ActiveCare®. The Dashboard provides two options, “Overview” and “Problems” It offers novice users a “fix and forget” solution permitting them to literally click a single button to repair all problems diagnosed by the software. The opening screen provides easy access to video tutorials, documentation and marketing collateral to permit users to familiarize themselves with the features and interface of the software. Overview screen. The Graphic gives an instant assessment of system status. In addition to the interactive Dashboard and Toolbox, System Mechanic 10 offers what iolo calls ActiveCare®. 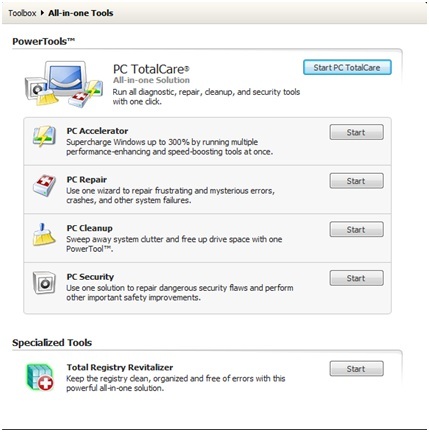 The Active Care® option allows users to literally put computer maintenance on auto pilot, it runs in the background when the computer is idle and constantly maintains system health. It can be configured to suit the needs of novice and expert users alike. In addition to the various technical features, one key competitive advantage is iolo Technologies innovative business strategy, “Whole Home Licensing™”. Unlike its competitors, iolo Technologies doesn’t limit users to 3 installations of its products. In recognition of the multiple PCs found in modern homes, they have introduced the concept of site licensing for home users. Now consumers can buy a single copy of the software and install it on ALL of the computers in their home. For the purposes of this review, TechwareLabs used an anemic and geriatric Hewlett Packard Pavilion DV9000 laptop with an AMD Turion™ 64 X2 TL58 1.9 GHz processor, with on board Nvidia graphics and 2 GB of ram. The OS is Windows 7 Professional, SP1. The software was downloaded via the iolo download manager and installed using the OEM defaults. The initial analysis identified problems that ‘required’ attention and presumably, intervention; rather than allow the software to automatically repair all problems, the reviewer chose the “View Problems” option to display the results of the search.